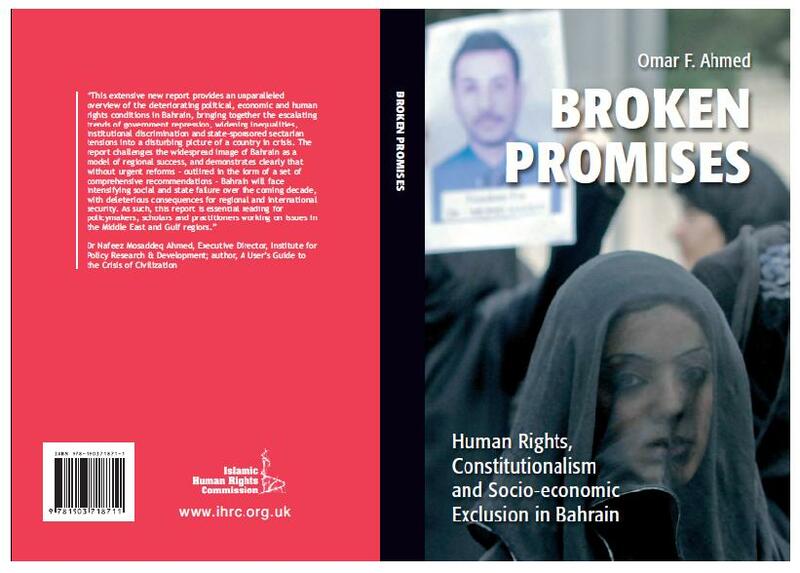 In 2009-10, Islamic Human Rights Commission (IHRC) undertook work pertinent to constitutionalism and democratic reform within Bahrain. The aim was to highlight the failure of the state to uphold its promises of reform from an absolute monarchy to a constitutional one. Omar F. Ahmed’s report looks into the contentious issues of constitutionalism and democratic reform within Bahrain. In the report, Ahmed argues that ‘the reign of the current ruler, King Hamad al-Khalifa has represented a failure of constitutionalism and a resurgence of monarchical cronyism, institutionalised by state apparatus and enforced through brutal deployment of the security forces.’ In doing so, Bahrain has been unsuccessful in preventing social-economic exclusion. The report discusses exclusion of the wider general population, in addition to the more specifically targeted institutional discrimination against its Shia majority. Additionally, the report presents the view that, linked with social exclusion, there is a continuing trend of human rights violations within the country, ‘carried out by the Government and the country’s state institutions, predominantly its security and intelligence services.’ The abuses that have been emphasised in the report are, firstly, unwarranted restrictions on the freedom of expression, assembly and association. Secondly, using information obtained through human rights groups, the report accuses authorities of arbitrarily detaining opposition figures and human rights activists, and subjecting numerous prisoners to torture. Whilst deeply critical of the Bahraini regime, the report puts forward recommendations as to how to move beyond the vicious cycle of repression and corruption. For further information and review copies please contact Dawud Mwilwa Kapansa at dawud@ihrc.org or on +44 20 8904 4222 or +44 7930 593566.